The amber is not melted, pressed, artificial. 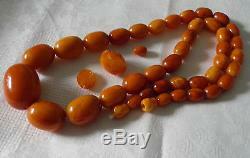 Each bead was hewn from a single, unique amber stone. 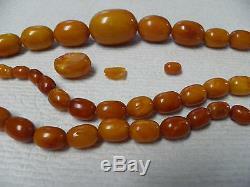 When restrung one stone dropped and broke - it shows that the amber is natural and hewn from one stone (see photo) There are 39 beads on the necklace plus one extra small bean (see photo) - the broken bead is not included. The largest bead is 34mm by 24mm (8.5 cm circumference) and the smallest is 10mm by 9mm. The clasp is the original amber screw clasp. Please note that colors and saturation may slightly vary from originals - monitor's setting can affect them too. See pictures for more details. A gift box is included. We work hard to make our item descriptions as transparent and descriptive as possible. 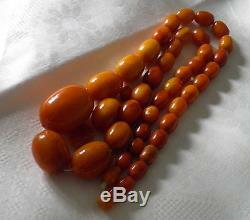 The item "Antique Vtg Necklace Natural Baltic Amber Red Beeswax Butterscotch Beads 84.4g" is in sale since Monday, May 09, 2016. This item is in the category "Jewelry & Watches\Fine Jewelry\Fine Necklaces & Pendants\Gemstone". The seller is "hydrangea1111" and is located in Naperville, Illinois. This item can be shipped to United States, to all countries in Europe, to Canada, to China, to Japan.